Tag Archives for " podcast subscribers "
I’ve been podcasting now for over ten years and I still crave new subscribers. Now, don’t get me wrong, the benefits of podcasting for me are so strong I would do it even if no one subscribed, but exposure is one key reason to put in the time and effort (although it’s not that much time and effort) and getting more listeners can only help. If you’re interested, you can find, listen, and subscribe to my long, long list of archives here. The key to gaining more subscribers is to form a connection with your audience. Give them a sense of who you are and how you think and, not only will it drive traffic to your site, but it could also open up doors for customer growth and monetization. If you are interested in the technical aspects of podcasting, here’s a show I did with John Lee Dumas of Entrepreneus on Fire where I sketch out exactly how I podcast. Below you’ll find seven tactics to consider as you build your podcast following. One of the best ways to drive traffic is to find and interview interesting people. It doesn’t hurt a bit if they are influencers in your niche. These folks most likely have a large audience and could drive traffic back to your site. You shouldn’t expect your guests to promote their episode, but you should ask and make it easy to do if you want to gain from this form of exposure. While promoting through social media channels is great, having guests send a link to your episode through email is definitely more effective. But this can be challenging since most people are protective over their email lists. One way around that is to suggest they add a “PS” to the bottom of an email that is already going out that week. Take it a step further and pre-write the email and social materials for them and add it to a follow-up email in link format. A final word here – your guests don’t have to be well-known experts, sometimes finding a guest with a smaller, fully engaged following in your industry is an excellent way to get exposure to the right group – in the end that’s what matters. If you’re new to podcasting, it’s probably a good idea to publish at least three times per week in the first eight weeks. iTunes’ gives you eight weeks from the day that you launch to be featured in the “New & Noteworthy” section. This is your best chance of being discovered organically. Even if you’ve been podcasting for longer than two months, it’s still a good idea to post a recording more than once per week – even for a temporary period as a little “boost”. Breaking it down in terms of simple math: if your goal is to reach 100,000 subscribers. 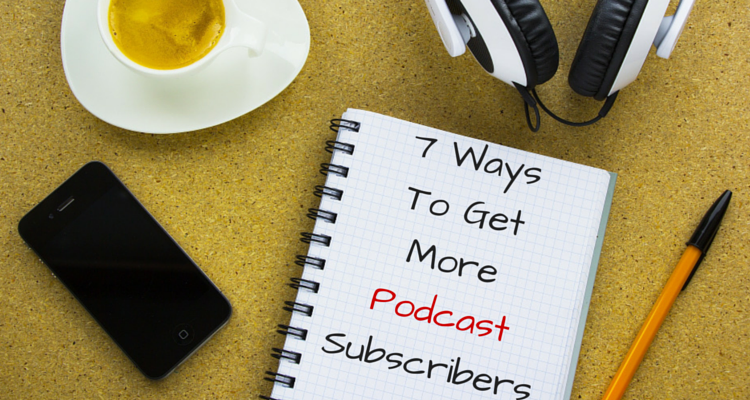 You would need to build your podcast up to 2,000 new subscribers per weekly episode for a year to reach your goal. Or you can reach this number by getting 500 subscribers per episode, with 5 episodes per week. Like pretty much any form of content, ad, blog post, book – the title grabs attention – without that you stand little chance of standing out as people scan through RSS feeds, Tweets and directories. Choose a title that makes people stop and think. Grab attention by making them feel some emotion just by reading the eight to ten words at the top of your post. Just as guest blogging is a nice way to gain exposure to someone else’s audience, guest hosting someone else’s podcast can be a great way to find new subscribers for your show. Visit other podcasts and check to see if the host has published episodes with a guest host. See if they’d be interested in guest hosting your show or if they would want you to interview them on their show. From there you can propose a host swap or guest host spot for their show. Make sure you’ve listened to their show enough to know who their audience is and how they like to deliver value and then propose a topic or format that makes sense and fits in with what their listeners will certainly love. Offer a gift like an eBook or free trial to a program. Use My Podcast Reviews: iTunes separates reviews by country, so if someone from Canada leaves a review, people in the US can’t view it. My Podcast Reviews offers a free solution that will make all of your iTunes reviews visible to everyone. Many people find shows they want to listen to by browsing through categories in podcast directories. You must submit your podcast to many of these directories to have any chance of being discovered by users of these directories and apps. Of course, you’ll want to make sure that your RSS feed for your show, tags and artwork area all working and up to standards. Use FeedValidator.org and make sure it says “Your feed is valid” before submitting to any directory. The Blubrry Podcasting Manual is a great resource for the most technical aspects of managing a podcast. Google Play Music – This directory is rapidly expanding, and it’s Google! Stitcher – Stitcher is one of the best apps for podcast listening so make sure you submit there. Many podcast listeners and subscribers are also social media participants. Let’s face it; it’s much easier to attract people who already listen to podcasts than to start convincing people to listen. One of the first keys to social sharing of your podcast is to have an image that grabs attention. Images can be used in your post, in iTunes (which will appear as your thumbnail and will be significant to browsers when choosing shows) and in social media. Include your logo or photo, a photo of your guest and a brief title. Be careful not to add too much text to the image so you can boost the post on Facebook. Here’s more on Facebook guidelines here. When you boost it, define the criteria to target followers of your featured guest. As I mentioned earlier, you should write up example social media posts for your guests to share. It will make the process easier, and they’re more likely to comply. Use a tool like BuzzSumo to find what podcast episodes were shared the most and share those shows again with another tag to the featured guest. If you podcast once per week, do this monthly. If you’re recording daily, you can make this a weekly routine – or feature your “Top 5” on a monthly basis. Turn your podcast into a YouTube video to leverage your content across multiple mediums. It takes time and commitment to produce and publish a podcast but don’t forget to spend as much or more time promoting it!